Tom Cruise often comes across as a pint-sized, arrogant, pampered Hollywood cliché, and his notorious appearance on The Oprah Winfrey show could (and perhaps should) have been the final nail in his career’s 5ft solid gold coffin, yet Cruise somehow bounced back onto screens earlier this year with the globe-trotting action adventure Knight and Day (2010). Knight and Day’s plot is pretty straight forward: girl meets mysterious, charming stranger at airport; girl coincidentally ends up sitting next to him on the plane; they have a cordial but mildly flirtatious conversation and exchange soppy dreams of the future, plus names. Enter June Havens (Cameron Diaz) and Roy Miller (Cruise), or so he says *wink wink*. However, as June emerges from the toilet she discovers that all her fellow passengers and both pilots have been shot by Miller. Miller crash lands the plane into a field before warning a bewildered and hysterical June that a) not everything is as it seems and b) her life is in danger. Knight and Day plays out as a standard action flick; lots of guns, explosions, gadgets and stunts. Unfortunately, a number of fairly lazy/borderline cynical narrative tactics are used to progress the plot. June (rightly) panics under machine gun fire at several points throughout the film, and so to keep her from jeopardising her own safety as well as his own, Miller decides to drug his love interest. 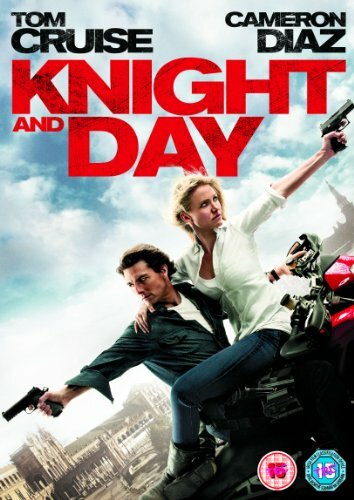 Knight and Day is, at its best, a decent ‘date’ movie (minus the occasional druggings) and there is certainly enough to take away for both a male and female audience; simple narrative, impressive stunts and the added enjoyment of trying to catch a full body shot of Cruise to see if he is wearing lifts. Just don’t expect to be challenged intellectually or emotionally.